New products worthy of some precious kitchen cabinet space. At a time when bigger, brighter and more expensive smartphones can do just about anything we’d like, cooking is one thing we’re still left to do the old-fashioned way. But as innovation marches forward, we still eke out a few new tricks, toys, and tech revelations that make our lives in the kitchen easier. Here are ten game-changing items we encountered in 2017. Calphalon shrunk the footprint of its heavy-duty anodized aluminum pots and pans by creating a stackable set with flat, knob-less lids that are super apartment-friendly. Ember’s ceramic smart mug, a first in the market, give you the feeling of a cozy piece of pottery while allowing for self-heating and app-enabled temperature control. vSpin’s Active Wine Decanter sits on a rechargeable base equipped with a spinning magnet that cuts down the aeration of a full bottle of wine down from two hours to five minutes. Alkemista is a pretty simple concept: a stainless steel filter that allows your booze of choice to infuse with your flavoring of choice without any particles getting into the liquid. This one, however, sits elegantly on your bar cart blending seamlessly into your other bottles. For your pressure cooker, slow cooker, or Instant Pot, this “why didn’t this exist already” device makes it easy to prevent food from sticking and letting unwanted fat drip away. OXO’s latest take on a fat-separating cup does away with the low-positioned side spout and puts a leak-proof spigot on the bottom of this four-cup capacity vessel. With the squeeze of a trigger, the fat stays on top while your drippings drain downward. If you’ve been having trouble keeping your silicone baking mats neatly rolled and organized, Silpat released a silicone band that makes it a snap—or rather, a slap. Yup, this is basically a slap-bracelet designed just for the job. 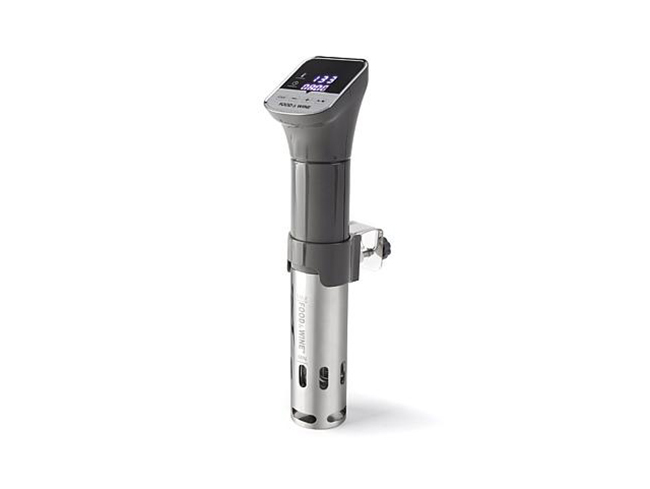 For under $100 you can cook with the near foolproof sous vide method, while also pulling double duty as a wine chiller, as this device will maintain steady high and low temperatures. Okay, hear us out: until now the only way to have a truly wireless fruit phone experience was to pretend to talk into an actual banana. This Bluetooth-enabled handset finally started shipping this year and makes all of our (and Raffi’s) dreams of taking a call from the produce basket a reality. While the multi-use cooker has been around since 2010, 2017 was really the year this device took over kitchens across the country, spawning dedicated YouTube channels and cookbooks in the process.